Either I forgot or I did not notice, but when Hitomi has that dream sequence where Allen is with her in the real world (and who apparently knows how to use a pager, [HA HA! Foreshadowing! ]), she dreams him repeating the near exact words Millerna professed to him in the previous episode. It’s a nice touch showing how Hitomi’s teenage subconscious is working inbetween kidnappings by Gecko Men and cities in flames, compartmentalizing a Princess’s statements and refitting them into her new objet d’drool. Then when that pager keeps finding its way into the story proper, she gets hit with a whammy when it is found out Amano is still concerned about her, and will even try calling it in the hopes she will reply. Great set-up and payoff there show, even if you’ve made the poor girl even more conflicted than she was the last episode, and this shot doesn’t help either. Are you surprised Van is the angel in Hitomi’s visions? No? Is that a bad thing? No. From the way the show obscured him in those visions it was going to happen sooner or later, the key to making it work is enacting it in the most effective circumstances (read the second paragraph here). This episode succeeds in that with gusto, and more importantly, with gravitas. In the first half, Hitomi and Van have time to sit down and have interactions that do not involve the former having to save the latter. It leads to an eventual spiel about family life, with Hitomi talking about her intact nuclear, Japanese, family and Van’s… mostly dead family sans Merle and Folken. 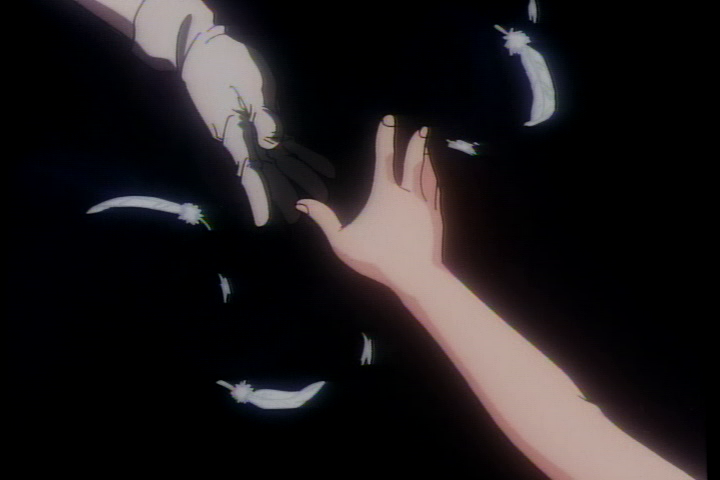 Although in the case of Van despite the tragedy of such nevermind the bitterness he has of Folken, he does not resent Hitomi’s relative normalcy, and remains steadfast in his objectives. 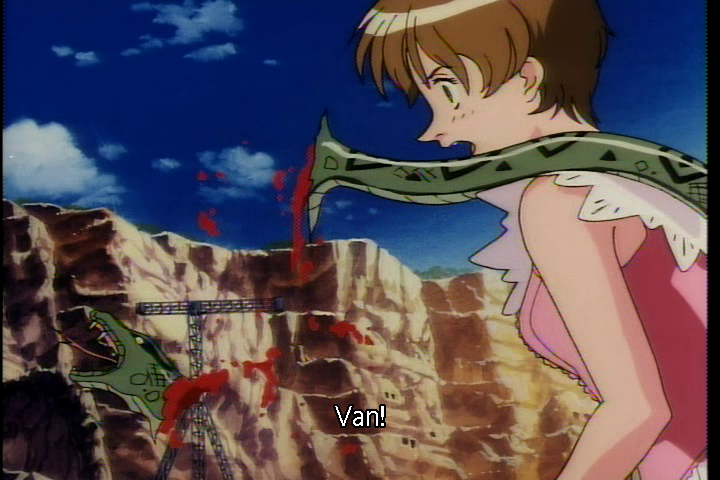 Even if it is only the ninth episode, Van sure has come a long way based on this conversation. 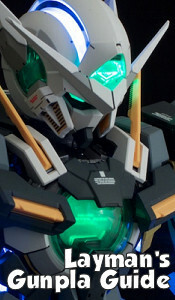 He is self-aware of his need to improve, his objectives in life, and is a bit more copacetic with Hitomi in conversations. Since they are on the run now, his offer to her to join them is impactful, and like Balgus before him, has personally taken up the unenviable task of finding a way home for her. Awesome. …Poisonous snake murdering kinds of awesome. Also awesome is the fallout in Asturia after Allen’s intervention in the previous episode. Mr. Schezar is imprisoned because of it, and alongside Millerna, we get another dimension of Gaean statecraft I forgot. While old King Aston is a conniver of caliber, he reveals quite a bit of personal sentiments in his scene with Millerna. That Princess Marlene he, Allen, and Princess Ceres speak of? She is not only dead, but also married into the Duchy of Freid, the country Zaibach plans to invade in the near future. Of course had she not been dead, Dear King would never have considered letting Asturia be used as a launching point for invasion. These little moments… They’re there and I forget them and I’m kinda disappointed in myself for doing so, as it shows how fine the writing in carving dimensions to even minor characters. It is also fine in establishing the very noble nature of its protagonists. The final scene before Allen leaves has every major player in that Asturian conflict: Him, Millerna, and Princess Ceres operate on a level of goodness bereft of cynicism and ulterior motive. Allen wants to be chivalrous and protect his country, Millerna wants to protect Allen AND her country, and Ceres wants to protect Millerna. The moments at this juncture both shine and surprise, with Allen using Millerna’s infatuation of him in a clever fashion (I won’t spoil, it IS quite clever) to keep her away, and Ceres’s surprise he would do such a thing, upending her initial negative thoughts about him. 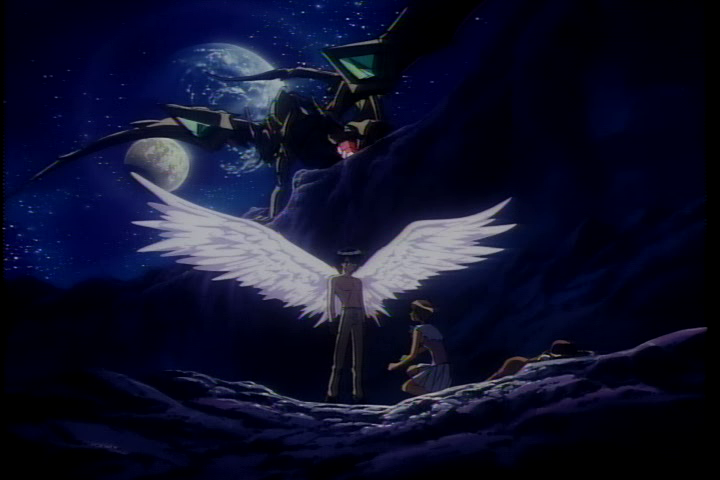 What a great way to set the stage for all the players to reunite in Freid, quite frankly the best arc in the series. Get excite. Mystic Eyes – In a surprising counter to the uplifting orchestra of Yoko Kanno or the sweet sounds of Maaya Sakamoto, Escaflowne’s ending is a peculiar J-Pop number by one Hiroki Wada. Moments after an episode ends you’re then given a sudden case of thematic whiplash the moment it starts playing. 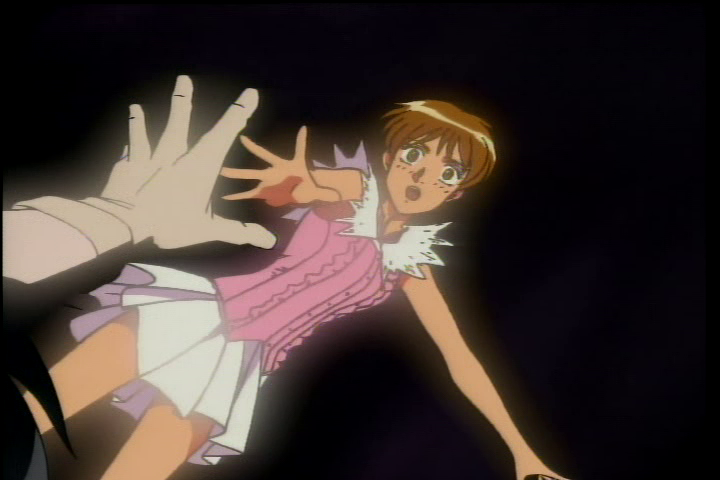 Clearly if you’re into Escaflowne, you expect to have alongside orchestral flourish, groovy techno. The song itself isn’t TOO bad, just… strangely placed. I wouldn’t listen to it readily on its own, but when juxtaposed to the ending animation it works well enough, what with its kissy-kisses and Van standing longingly in the rain. You could do a lot better, and you do can do a lot worse with your animu endings. 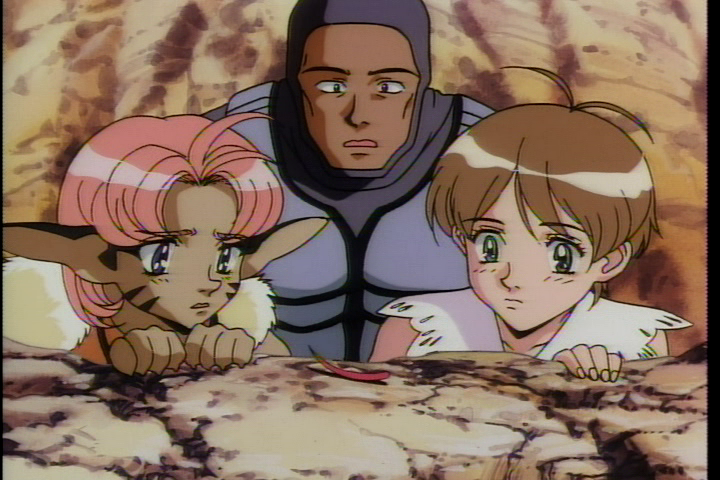 I think this is the juncture where my analsis of the Escaflowne dub slows down to a trickle, if not a stop. This was the part where I gave up on it. Wasn’t worth it anymore. 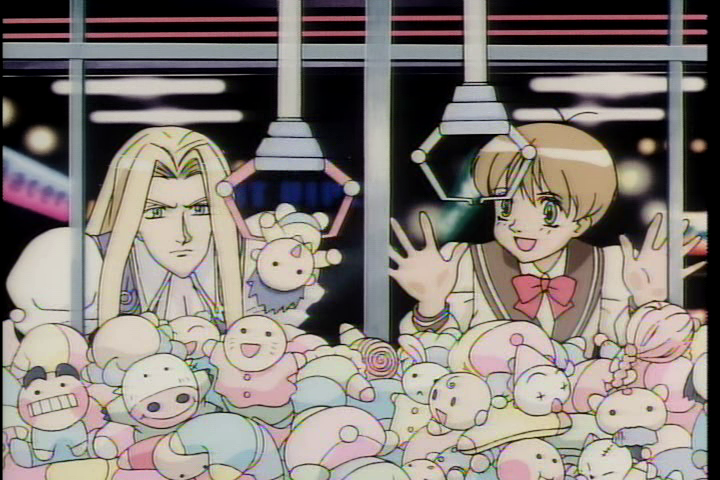 This is the first episode where Folken and Dilandau are completely absent after their debut. Works for it, since it allows us to focus on our heroes. What happens when you effing love science over your job to capture trespassers. This guy. 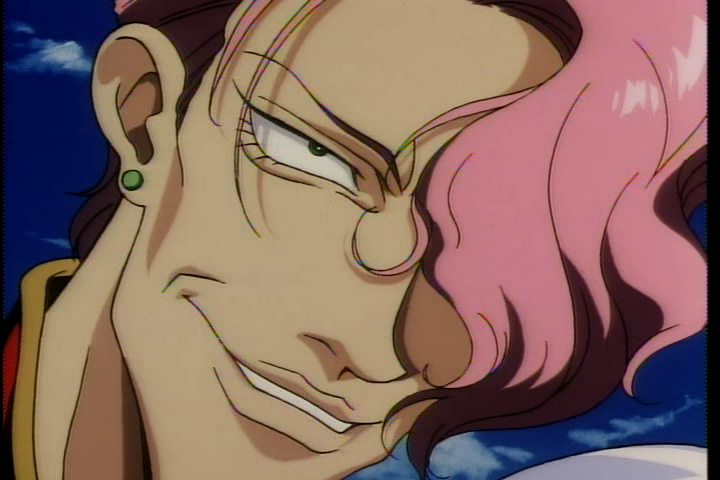 He only appears in this episode, but he leaves such an impression on you. He provides a reasonable enough conflict for Van in lieu of Dilandau, and the fact that he’s a complete unknown helps to escalate tension since we don’t really know what more to expect from him. Another nice touch. 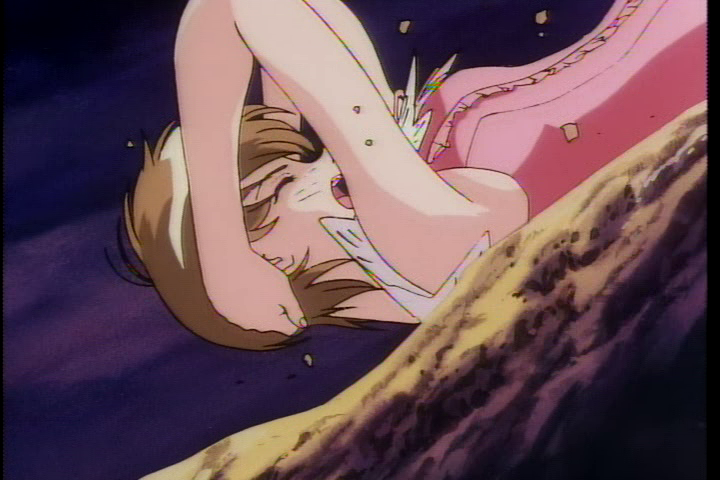 Hitomi tries to protect the back of her neck as she slides down a slope at episode’s end. Not very nice touch. Animation error. Check out those hands.